Ethnic Paintings. Naive art and colorful women of North India. These Indian paintings are exhibited on the first floor and are part of the donation of Mr. and Mrs. Hans Herrli. In love with India, they have made this collection during their multiple trips to India. 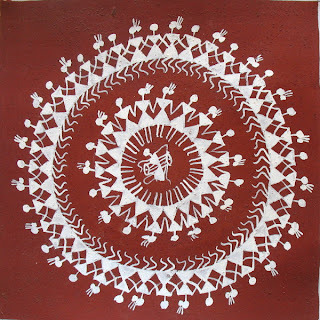 The selected works are representative of a part of the Warli art and other art in the region of Mithila. The Warli tribe has a population of about 300,000 members and live in Maharashtra, north of Mumbai (Bombay). The name comes from warla, which means a parcel of land. They have their own mode of belief, life and custom. Their pictorial art was discovered in the seventies. Although there is no precise information on the exact origins of this art, Warli painting is a continuation of a tradition whose origins are between 2500 and 3000 BC. It is the expression of daily and social life of the tribe. The Warli used to paint the walls of their houses, and this was the only means of transmission because their dialect is not written. The paintings are only done on very rare occasions such as marriage or crops. Iconography is very rudimentary and is based on the circle (the sun), the triangle (the mountain) and the square (the sacred enclosure). The paintings depict scenes of hunting, fishing and cultures, festivals and dances. 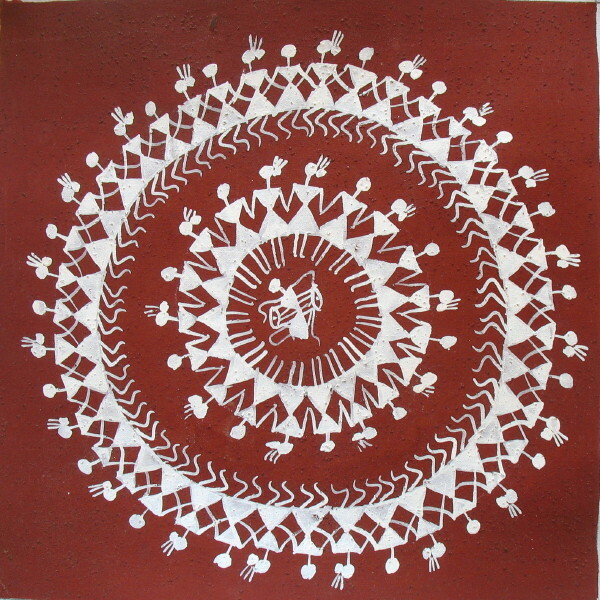 The Warli use only white colour, made from a mixture of rice paste, water and gum binder. The paint is applied using a previously chewed stick at its end to give it a flexibility comparable to that of a brush. The paintings of Mithila or Madhubani derive their name from Mithila region in Bihar. They were traditionally made by village women who decorated the walls of freshly plastered mud houses, at weddings and religious ceremonies. The paintings represent Hindu deities. We find therefore illustrations of Krishna, Rama, Durga, Lakshmi and Sarasvati. All spaces are decorated with geometric and natural elements like flowers or animals. The art of contemporary painting of Mithila was born in the early sixties after the terrible famine in Bihar. The paintings on paper or canvas have been used to supplement income. This is how this art was discovered and brought to the West. The paintings use natural pigments and bamboo sticks instead of the brush.